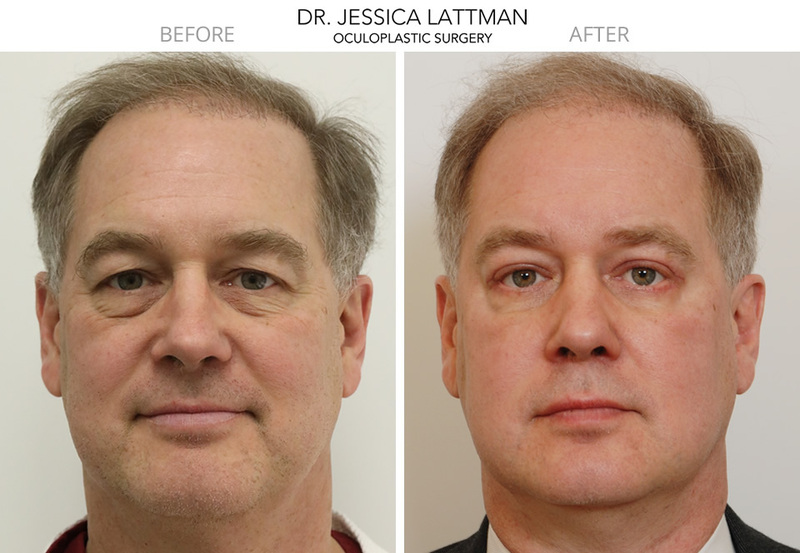 I explained to him during his consultation that the best option for him was upper and lower lid blepharoplasty. This surgery would give him the improvement he was looking for, with a long lasting and natural result. On the day of surgery we spent time together, before going into the operating room, discussing again exactly what I was going to do and what he wanted to achieve with the surgery. Then I carefully marked his eyelids. I use these markings as a guide during the surgery. After surgery he went home with a private duty nurse for one night. He was able to start working from home after a few days. He came into the office a week later to have the sutures taken out, and was back in the office the following day. This post-op photo is taken one month after surgery. He is mostly healed, but some slight swelling and redness will continue to resolve over time. He was completely thrilled with his result and the whole experience.